Newborns have particularly sensitive skin, so moms are extremely cautious about the products they use on their babies that haven’t built up immunities or tolerances to various creams, lotions, and baby wipes. Some babies and toddlers continue to have extremely sensitive skin, so moms choose wipes carefully. Enter: Water Wipes. They’re are made for those with extra sensitive skin. The natural and chemical-free wipes are the only choice for those who want to avoid any and all additives. There are some things you need to consider before you choose this wipe for you and your children, so be sure to read this review carefully. You can’t find a wipe as natural and chemical-free as Water Wipes. When diaper rash is a problem, the only thing you can do is start eliminating anything that’s chemically-treated to try to figure out what’s causing it. Sometimes the cause is as simple as a fabric softener or the baby wipe you’re using. Pediatricians all over have suggested Water Wipes because it literally only has two ingredients: water and grapefruit extract. One thing you need to keep in mind about the Water Wipes is that there isn’t anything in there that’s going to inhibit the growth of other things, such as mold. So, you need to store them in cool, dry places, and use the wipes up quickly. …isn’t anything in there that’s going to inhibit the growth of other things, such as mold. Water Wipes, which are made of polyester and viscose, are soft to the touch, and the lack of texture ensures that the wipe just glides over your baby’s skin. This non-textured feature is a benefit for a newborn because you don’t need a wipe that’s super strong to handle bigger messes. However, once your baby is producing more solid waste, you may find that these won’t clean as well. …the wipe just glides over your baby’s skin. Your package of wipes may seem dry at times, but that’s only because the water may have settled at the bottom. Some chemicals that are present in other wipes serve as binders that help keep each wipe moist. These have none of that, so you may need to seal the top tightly and shake to remoisten the wipes. These wipes may be too wet for some moms. Again, because of the lack of chemicals, you’re just using wet cloths, essentially, so they could be dripping wet, which could produce more of a mess than what you’re trying to clean up. …may be too wet for some moms. When Water Wipes were first introduced, they were the convenient answer to the old way of wiping up a newborn baby. Not only were the wipes chemical-free, they were easy to grab, use, and toss. You didn’t have to grab a cloth, wet it, and then use it. They are a generous size of 6.4×7.3 inches, which moms seem to love. You can buy these in small packages with just 10 wipes per package, or the 60-count size. The 10-wipe pack is easier to carry when you’re on the go, and you can use them up quickly (so there’s no concern of mold). The 60-count package is a good size for keeping in your nursery or kitchen, and you should be able to use them up within a week with no problem. One of the biggest complaints of moms everywhere is that they don’t have enough hands to make the job of diaper changing easier. Another big complaint is a wipe package that won’t cooperate. Some wipes let loose three or four wipes at once, while others hold tight to the one wipe you’re trying to get, and you end up ripping it when you tug. Water Wipes are a happy medium, offering easy to use packaging. It should be noted that the sticker that’s meant to keep the wipes inside and sealed in the package loses its stickiness quickly. Plus, due to the simple and easy to use packaging, the plastic is prone to tearing, which means your wipes may dry out prematurely. So be sure to grab a plastic tub for longer use. Water Wipes are a happy medium, offering easy to use packaging. When it comes to your baby’s safety and health, money is not the biggest concern. But budgeting is necessary. So, when you’re using 20 wipes per day, and they’re more than a dime per wipe, you’re looking at a huge monthly expense. 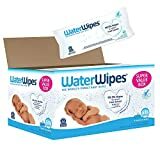 The Water Wipes have an MSRP of about $32.99 for a bulk box of 540 wipes, which could be reasonable or super pricey, depends on your baby’s personal needs. But right now on Amazon, you can find the Water Wipes for even LESS than MSRP (Check it Out). These wipes are about the most natural cleansing wipe you can use on your baby or even your own skin. Because they only contain water and grapefruit extract, you can use them for faces, hands, feet, bottoms, and any other body part that’s messy and needs cleaning. These wipes are strong and don’t tear easily, which is important when you’re wiping up various messes. However, the texture-free cloth-like material can sometimes just glide over skin, pushing the mess about, rather than picking up the mess. It can help to wring the wipe out a little before using if you find it’s not cleaning well. Water Wipes are probably one of the most expensive wipes you can buy for your baby, but for many moms who want the absolute best free and clear wipe, it’s worth the added cost. Although some of the wipes features can be inconvenient – wipes come out in multiples, they’re often too wet, and may not clean up extra messy messes well – the lack of chemicals is enough of a trade-off. If you’re concerned about additives, such as dyes, fragrances, and harsh cleansers, then these wipes could be the best choice for you and your newborn. Expect to pay about double or more than other standard natural baby wipes, but also expect to not have any allergic reactions with these wipes. It’s really all about what you and your baby need as well as what you consider a main priority.